The Center of Creativity – Learn and Have Fun! At the Center of Creativity, we'll work with any age group and design a workshop to fit their skills and interests. If you have a group that wants to get together, have fun and create - contact us today! Learn the techniques we have used in past workshops with these handy worksheets! Contact us for your next group outing! 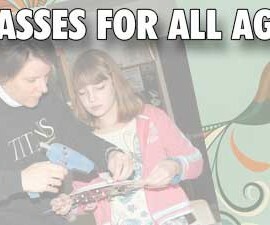 If you have a group of people who like to create and have fun, consider an Arts Workshop at the Center of Creativity! We can accommodate almost any size and age group.